Broken tailbone – or dislocated tailbone? 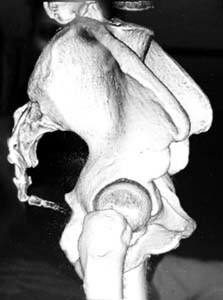 www.coccyx.org > what is coccydynia? Here the tailbone is sharply angled inwards, and may cause pain when sitting and at other times. It can also press on the bowel, causing problems. But it is not a broken tailbone, because the bone itself is not broken. The tailbone consists of three to five small bones, attached to the sacrum. These bones are sometimes fused together in groups, but more often have thin disks between them, allowing the coccyx to flex a little. If you damage your tailbone, such as by falling on your bottom, what normally happens is that the tailbone dislocates at one if its joints, or at the joint between the tailbone and the sacrum, rather than one of the bones breaking. Sometimes the two parts get fused, or ankylosed, in the angled position. Most medical books, such as Gray’s Anatomy, say that the bones of the tailbone are almost always fused together in adults. This is untrue. X-rays have shown that less than 10% of the population have all the bones of the tailbone fused into one segment. 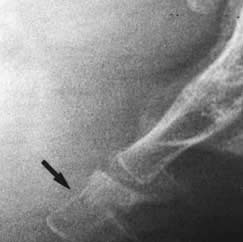 Doctors who have no experience in this area look at an x-ray of a tailbone bent at an angle, and assume that it is a broken tailbone, when it is really a dislocation.